Do you remember this photo? I wish I didn't. The photo won a Pulitzer Prize award. It was taken during the Sudan famine. It is not precisely known what happened to the little girl. 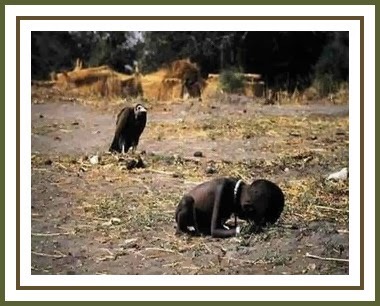 The photographer, Kevin Carter, came under such condemnation for not helping her, that he fell into a deep depression. Three months after the photo was taken, Kevin committed suicide. His motivation for that act will never be fully known. He left a diary behind, in which he had written a prayer to God, promising to always appreciate the food he had - no matter what. It is tragic enough to see the little girl - a victim of starvation - even if she lived. What a horrific tragedy!